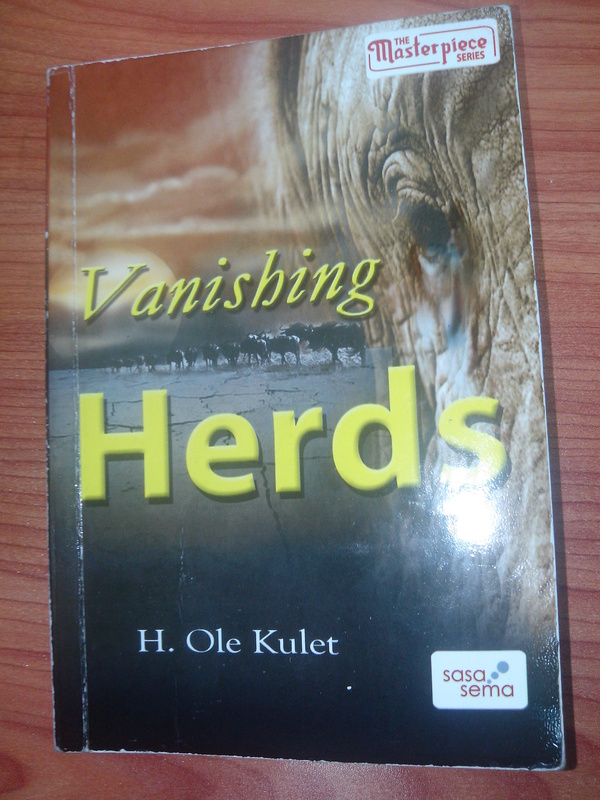 Its been a great time to be Henry Ole Kulet as he won the Jomo Kenyatta Prize for literature for 2013 for his book Vanishing Herds. The book has gone on to be one of the most reviewed books of the year with opinions popping up all over the place.Khainga O’Okwembaon his literature column in The Star the Literary Postcard calls reading the book a Dialogue with the great Maa novelist . Daystar University lecturer Larry Ndivo correctly focuses on the environmental aspect of the book as this is a huge theme of the book. Almost president Kingwa Kamencu also talks about this book in The East African. Lets focus on the book itself. It talks about Kedoki and Norposia a young Maasai or Maa couple. The man Kedoki with a thousand cattle decides to drive his cattle from Olomoruti where they meet to his home at Nkararo. He has lost two of his siblings, brother and sister, to bandits and he wants to go back home. Norpisia had also lost her siblings to bandits. She had been forced to leave her home for safety and live with her grandmother who taught her the art of medicine as known by Maa healers. This includes the herbs in the forest and the relevant treatment techniques. She learns her to divine dreams and other supernatural occurrences. She also learns to handle weapons a skill few women know. She then moves back to her home and marries Kedoki. When they start their journey I assumed that within a chapter or two we would find the protagonists at the destination where the real action begins. As I read, I realised that the journey was actually the story. Seeing as the couple traipsing across country was the story I would really have appreciated if the publisher had put a little map in the book. This would have allow some of the readers who are not familiar with the part of the country being described like me to follow the action more informed. The prose in Vanishing Herds is some of the best I have read in the last few years. This guy can weave a tale and his descriptions as we go through our journey with the characters is compelling. I would never have imagined that the journey of a few herdsmen crossing the country with a few of their cattle and their challenges would be so epic but this Ole Kulet guy nails it. Its like the tale of the Israelites crossing the desert led by moses for fourty years. Its like a tale of the folks in the US settlers/colonialists moving across to settle the Western parts of that country. Its like a retelling of that Great Trek of those guys from down South of this continent. Apart from the beautiful prose it becomes a learning experience for me. The Maa people know so much about the environment they live in and Ole Kulet knows it as much as the most knowledgeable of them all. We are given long tales of the country as it was and where it is headed. Then there are the characters who have been very well developed. Especially the couple moving across the country. Norpisia is shown for a whole range of emotions; despair, joy, sadness, happiness, melancholy. This is a lady you want on your side when unmentionables hit the fan. This one is seen when she kills two bandits who are trying to steal their cows single handed. OK maybe not single handed but with weapons but still this is pretty awesome. This woman with a strong character goes about her tasks going on a saving-human-life-with-her-herbs spree wherever she goes. Also a strong character is accidental feminist Kedoki who has to learn to live with a strong woman as a wife which is not too well accepted in the Maa culture. There are other cool supporting characters like Lembarta and his brother Masintet who help them drive their herds across the country and environmentalist Eddah Sein. The ending. I hate it so much. It was such an anticlimax that if I had been at the reading report stage I would have insisted a more fitting (not sure which) end. Something better than the end as it came. In spite of the ending, I enjoyed this book immensely and will be reading his other titles as they become available. I recommend this one. i am so much impressed with this book. from my primary school age i have been reading Ole Kulets books and have greatly impacted me to have the spirit of writing as another maa writer. may GOD BLESS your work.